Dawson Jewellers was established in 1980 and has a history of great service and personal, bespoke products. For their web site, we wanted to create something different to the standard “centered, fixed-width” designs that the vast majority of pages use. Instead, the design that we created uses a flexible background space to expand and contract to suit any monitor size. 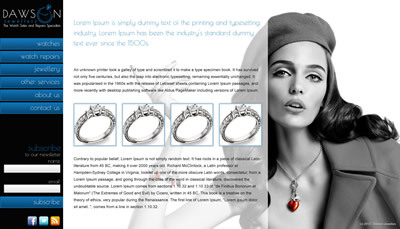 The content area is translucent, allowing Dawson Jewellers to add large, attention grabbing images to the screen, in addition to other images within the content area. The page is “fixed” in teh browser, which means the image and navigation stay on screen at all times whilst the content area can scroll to show more text/images/videos etc. 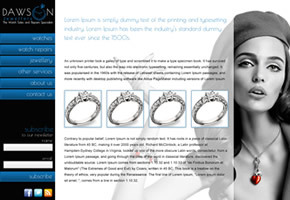 Very different and unique – just like Dawson Jewellers!